This speech therapy homework is ONE PAGE for SEVEN DAYS! Your students will love to color the daily holiday and seasonal scenes as they practice their sounds. Easy for print-n-go access to send home for carryover. Word lists include all positions of words. Perfect for all year long! This resource includes the following sounds in all positions: CH, SH, TH, F, V, T, D, S, Z, R, J, L, K, G, S Blends, L Blends, and R Blends. Includes 30 target words per sound (10 initial, 10 medial, 10 final). Includes 7 coloring scenes corresponding to the days of the week. Homework is finished when all coloring scenes are completed! This is a $30 total value! Buy now and get all future units for FREE! Like this one? 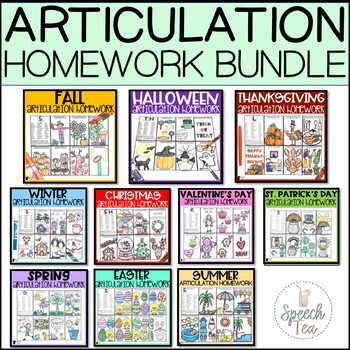 Try Articulation Homework Color Sheets for All Sounds!